1995 - Almost 10 years after its close, many of the structures are still present including the crossover bridge, spectator entrance and tower. 2001- The track is being reclaimed by overgrowth. The structures with the exception of that rediculously nasty cinder block bathroom have all been demolished. The staging lanes are now a parking lot for road work equipment and earth movers. 2002 - Sections of the track have been removed. The really cool pond in the back were we would go fishing and dig for fossils has been filled in and destroyed. The ground is being prepared for what is comming. 2003 - The construction project seems to have stalled out. Vegetation has reclaimed parts of the construction zones. The racing surface is broken and loosing its grip over the land. All that remains of the shutdown area and nets is its impression. 2005 - Nearly twenty years after its closure, this April photo shows that construction has exponentially increased its pace. The old red barn and pasture near the end are long gone and forgotten by most. New roads have been built that cross over the beds of the old track. 2005 - Only one month later, this May photo shows the beginings of a new neighborhood. What was left of the starting line is all gone. i remember green valley well. i knew Cookie McCullough that ran a 68 camaro named Cancer II that ruled his class. i also knew and grew up two streets over from Frank Cook and "knew" his daughter well. he drove the "Drag On Vega" funny car. Funny how time changes things. Having never heard of Green Valley Race City, I did a search on YellowPages and found that it was located just north of North Richland Hills, this is the same place correct? I read some websites about GVRC, but it never stated when it was closed down or I've overlooked it. When was it closed down? 2005 - This October photo shows the streets and layout of the new neighborhood. You may have noticed that the old entrance to the track has been turned into a major road (N Tarrant Pkwy) for a good while now. Only the road that used to pass by the emergency nets is named Green Valley Dr.
2007 - The neighborhood has been built complete with swimming pools, grass and the usual ammenities. If the contractors did not remove at least 6-12" of the soil, those people will be finding pop tops, broken spark plugs and mysterious patches of oil soaked dirt forever. 2009 - Smithfield road has been completely re-routed. The most current image shows that a section of the shutdown and return road are still barely hanging on. It also appears that the bridges that crossed the creek and part of the staging lanes are still intact. I suspect that many who live in that new neighborhood know nothing about its history. I wonder if those houses in the corner are having any foundation problems from the old pond that was filled in? Rest in peace Green Valley. At least some of us still have memories of living its history. That is a great story. I was there as well. I've posted some pictures from that race before. Maybe it is time for them to resurface here again for old time's sake. BTW - My father won his class at the very first Super Chevy Event held in Texas at this very track. I recently found his plaque from that event and have it proudly hanging up in my garage. It makes quite the conversation piece at times. Hopefully they all burn down from some left over fuel that may happen to explode under them. I remember that track as a kid and thanks to all the over growth that and many other nice things are forgotten everyday. That is cool! 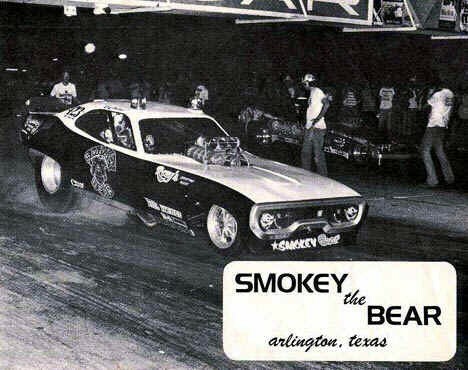 My father had a shop in Arlington on 303 that was a couple of doors down from the funny car named "Smokey the Bear" complete with flashing red lights and all. Last edited by SuperCPA; 07-07-2009 at 07:34 PM. Had alot of fun at that track. Yes, that's the one. I believe that Smithville was annexed into North Richland Hills at some point? I do not remember the exact date anymore. If I remember correctly, it was in 1986 shortly before the grand opening of the Texas Motorplex. Back around 2001 I found a Green Valley Raceway Souviner Program dated 1966 under the backseat of a friends 1967 Nova we were working on. I was bored one day and drove out there and found the remains of the track. It was pretty much like that discription with construction equiptment but the track looked mostly intact. I wish I had taken my camera and snapped a few pictures that day. It has been more than 20 years since the close. It will be interesting to see how much longer it takes for all traces of this legacy to be removed. I met Shirley Muldowney and Don Gartlits in person for the first time at this track in the late 70's. I was only about 7 years old LOL. That is cool! My father had a shop in Arlington on 303 that was a couple of doors down from Raymond Beatle. His Nitro Funny Car was "Smokey the Bear" complete with red flashing lights for those of you who don't remember. I still have a hat that he gave me when I was about 10 years old. was the Smokey the Bear car before or after the Blue Maxx? yeah, i can remember Frank & Jeri Cook coming to our house for parties my parents had. His daughter that i knew, Renee, was on the drill team to our pop warner (peewee) football team that i played on. there would be a party at our house each saturday night because we had a pool table and wet bar. i remember they came to about half of them. that was back between 1971-76.
man, i wonder what frank cook is doing now? his son Rusty was serving some time for robbing some gas stations back in the 80's. i don't really know what became of Renee Cook either. WOW! I hope you still have that program tucked away somewhere. I would have loved to seen it. I have visited the site on a whim two different times in the past without a camera in hand. The last time I was there, you could still barely read the Winston logos on the sides of the starting line. Apparently there had been some illegal racing going on there even after the close for a short while. They had placed concrete barriers at random accross the track to stop it. i also remember and attended when they held a Can-Am road race there after it closed. that was probably in 1984 or 85. Dang it! My memory has failed me. I need to make a correction. Raymond Beadle piloted Blue Maxx, not "Smokey the Bear". Both of which, however, I remember watching race at the Valley often. Last edited by SuperCPA; 07-07-2009 at 07:38 PM. Dang it! My memory has failed me. I need to make a correction. Raymond Beadle piloted Blue Maxx, not "Smokey the Bear". Both of which, however, I remember watching them race at the Valley often. hey not to hijack your thread, but check this website out for some cool pictures from this era. Interesting you mention that, I have a new Automobile Magazine here that talks about the old Trans-Am racing days from 1966 to about 1971. "Gurney called the 1967 event he won at Green Valley in Smithfield, Texas, "probably the toughest race I ever ran." The temperature was 113 degrees Fahrenheit in the shade and it lasted 4.5 hours." I didn't realize there was a road race track there. Can you see it on the satellite images? I may be possible to do so in photos 1 & 2 by someone more knowledgeable. I know that the drag strip became the straight portion and went through the turns visible in the pit area. Dallas International did the same thing in its day as well. Location: Die Wundergroin Schlägt Wieder Zu! Man, this thread brings back some memories. I used to race brackets there when I was in high school (Richland) the last couple of years before they closed. I really miss that place and those times. They just don't build them (cars or tracks) like that any more. Definitely brings back memories. I saw Knievel jump there, the Trans Am races, hell, my first trip down a 1/4 mile was there in my old 396 '68 Camaro. I now live about 1 mile from there as the crow flies. Have to drive past it every time we make a Wal Mart run. The only thing left is part of the old pit area where they store some old heavy equipment. I ran at green valley for a few years before it shut down. I was also there on the last weekend that they were open. I think that they had the clocks running a little bit "hot" since I ran an indicated 12.50 with a bad coil in a car that usually ran 13s LOL.... and that cinderblock shithouse was NASTY. There is no telling what was down in that hole. There was also some people there from the motorplex handing out pieces of paper saying that "DRAG RACING IS NOT DEAD IN THE METROPLEX" and talked about the motorplex. I wish I still had one of those handouts, but alas, I must have thrown them away. I was also dating at the time and my future wife came out and cheered me on. One night I won king of the valley (2nd chance race for the losers in the normal bracket program). Also saw the child molester gene snow out there a couple of times. Green valley was a friendly and accessible track (a racer's track), the motorplex was a lot more buttoned down and uptight. Anyone remember the slippery fish race team? Got any pictures of the bracket cars the last day? 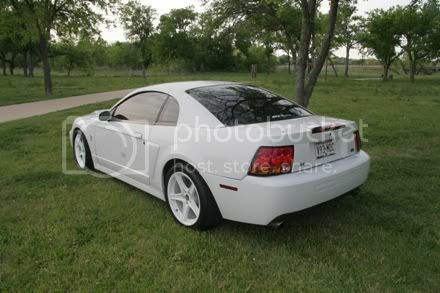 Like some crappy looking 69 Mustang that was red, yellow, primer, green? I won King of the Valley that day,and Fast Ford, got busted in the 0-13.99 class I think second round. Two out of three trophys that day, all stashed in the attic with boxes and boxes of other trophys. Those days are the best memories racing I have. Well that explains why I never heard of the track. In 86 I was 14, living in Irving and playing with G.I. Joe, Voltron and riding my dirtbike... .
That gooseneck in the background belongs to Paul Peyton of Peyton Chassis. I know him through a friend of a friend. Larry Reed, the friend of mine, used to drive a Super Comp roadster sponsored by Peyton. I think he still pulls that GN to races out at Kennedale. I'm gonna save this pic and show it to him, he'll get a kick out of it. i remember the first time i went there. a buddy and i were walking behind where they did the burn outs and wondered why nobody was standing there since the view was awesome. well after about 4 burnouts we looked at eachother and had pieces of rubber all over us. i'm sure we supplied a few people with some laughs there. The first time I went there they still push started Top Fuel cars and they did fire burn outs! I still have it tucked away in a file cabinet. It's not in the best shape. I'm guessing it might have been under that seat since September or August of 1966. It has some drawings and coloring in crayon from a little girl, so it might have slid under the back seat on her ride home. It's a cool piece of history with all the old ads, racecar pictures, track information, and even has a definitions section for people unfamiliar to drag racing. HA! I had forgotten about the "hot clocks". I can remember my father and his racing buddies talking about that suspicion on multiple occasions. I think I remember the "Slippery Fish". It was a Hemi Barracuda was it not? 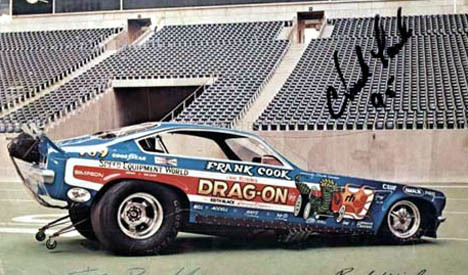 It was a neat time in drag racing when everyone had nicknames like Don "The Snake" Purdome, "Big Daddy" Don Gartlits, Tom "The Mongoose" McEwen, Gene "The Abominable Snowman" and "Eddie "The Thrill" Hill. I am sure that some of you will also remember local cars like the "Snuff Box" racing team or a rare Hemi named "Boogie Time". Sorry, these are the only ones I have found so far. Yep, that is the same trailer that you see at the races today. I see Paul & Barbara on a regular basis. They are still faithfully catering to the racing community. In fact, Paul did the work to beef up my Buick's rear end after breaking an axle. It should be good for a very long time now. I don't remember the crash; but, my father had a Honda 110 back then and I remember it getting unstable a time or two. Those things we dangerous as hell. Anyone remember when the finish line had tall vertical neon signs that would light up "Sprite"? Nice find! I had forgotten about some of those cars. I wish I could get my hands on some of those classic race cars today. I live a few hundred yards from what is left of the track. I walked on what is left of the track a few months ago. In '91 or so, there was a car audio competition out there. The NRH library has a DVD with some city history on it made around 1984 or so and it tells about the track and that it was a farm, etc. Yeah I remember going out there for some Truckin show around that time. Last edited by 2008rock; 04-14-2010 at 08:45 PM. WOW! yep, he always had perfect teeth. damn, it is good to see that he is still doing well. i think i will head out there now. EDIT: ask him if he remembers Gary Sherman and Jimmy Kier. I have roofed the house that sits right across the street from it. I have slowly watched it disappear. In I would say 03 The tower was still there. I so wanted to tell that lady off, she is in her 80's though. Her husband and his brother owned all the land around the track. The sold it off, and thats when all the new houses started going up. I unfortunately I only got to go to the track once. I was just a baby, and I dont remember it. i got my start loving cars back in the late 70's-early 80's there. my dad would take me there and let me play on his trailor and in the pits while he raced. i will have to look and see if i can find some pictures i have of him in his '74 Satellite that he built. I won my first trophy bracket racing my 72 chevy truck there while in high school. I still have several programs from various events, lots of pictures and the ticket stubs from the "last race". It was also my "last date" with my then g/f of over a year because she kept bitching about having to go to the races and that she wanted me to get rid of my "obnoxiously load and uncomfortable" 68 Plymouth GTX. So I politely asked for a bj on the way home from the races, which she obliged, then I told her that was for me to remember her by. Man, I loved that car. That is pretty cool.. To bad it had to go down that way. Those were fun times !!! Did you just wake up from a coma? 1/19/09, the last day of Free America. Pericles "Freedom is the sure possession of those alone who have the courage to defend it. "